One of the magical things about trips to New York as a kid were trips to the whimsical Serendipity 3 after seeing a show or going to a museum. We went with family, we went with friends, and now, when we’re back east (which is not so often), we take our own kids. It’s not that the food is that great, or that it’s an easy place to take kids. In fact,the food is sort of average, and the wait can stretch well past an hour. In the cold and dark. On the street. With tired and hungry and cranky kids. But the place is full of charm and eccentricity and serendipitous gifts on the first floor, and it’s magical if you’re a kid. The foot long hot dogs really are a foot long and they serve something called Frrrozen Hot Chocolate, which is worth the wait in itself. Even for the grown-ups. 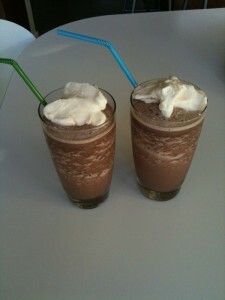 Frozen Hot Chocolate is rich and creamy and icy and made with a deep, dark mix of incredible chocolate. It’s served in an enormous goblet with a pillow of whipped cream and chocolate shavings. It’s legendary. For years, it was nearly impossible to replicate. Now the recipe is readily available, and I decided this summer to introduce my kids to it with the recipe provided by the restaurant and available on Epicurious. With a little more searching, you can turn up this recipe that has a more particular list of chocolates. But the generic one is terrific and made with things you most likely already have in your house. This recipe really makes enough for 4, but if you really want to recreate the Serendipity experience, use if to serve 2–or one enormous goblet to share. Needless to say, the kids loved it. The husband and best friend were pretty happy after dinner, too.